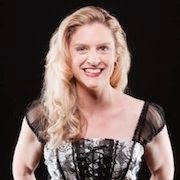 Please welcome Viola Carr to The Qwillery. 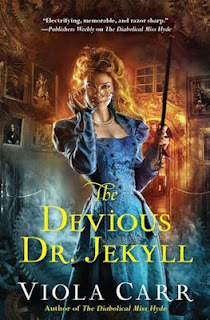 The Devious Dr. Jekyll, the 2nd Electric Empire novel, was published on October 27 by Harper Voyager US. 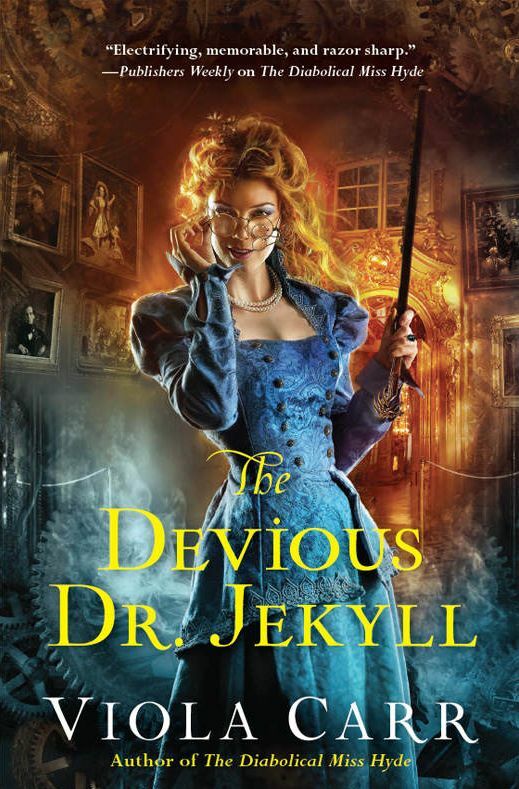 When I first had the idea for my Electric Empire series – that Dr. Jekyll's daughter is a physician and crime scene investigator in a steampunk Victorian London – I never truly anticipated how much fun it would be! Eliza is witty, clever, erudite and curious – a sort of intrepid female Sherlock Holmes, with Dr. Jekyll's inclination to mad science and a suffragette's insistence on gender equality and justice. But I also didn't anticipate a certain singular difficulty: writing about outdated medicine is difficult. I'm certainly no medical expert. But I have the modern person's appreciation of basic medical and biological facts – things that a mid-19th century person just didn't know. Their medicine seems naïve and downright dangerous to us, and in many cases it was. Anyone who's ever sat squirming in front of a primitive surgery scene in an episode of The Knick knows what I'm talking about – and fifty years earlier, things were even worse. Dyeing your clothes green with arsenic is a bad idea. If your sickroom's wallpaper is green, it's probably part of the problem. Germs are everywhere. They cause infection. Doing an autopsy on a decomposing corpse and then delivering a child without washing your hands in between is a bad idea. The rich are not special snowflakes when it comes to communicable disease; they get it just as readily as the poor. Oh, and smells don't spread disease. There's no such thing as plague-spreading 'miasma'. You don't get cholera because you're poor and smelly; you get it because you emptied your cesspit into your drinking water. Perhaps we should stop that. Blood types, people. That's why your random blood transfusions kill. Laudanum – tincture of opium – is not good for you, despite the fact that you can buy it anywhere. Sure, it might help your crying baby sleep, but you might find it's crying harder in the morning. In my series, I've taken a lot of liberties with the state of science and medicine in Eliza's time. I've introduced anachronisms. But hey, the classic literary characters that inhabit the pages of my novel have been dragged about in time as well. Eliza plies her trade in a time roughly equivalent to a quasi-1850s or 1860s – it purposefully isn't pinned down – but Strange Case of Dr. Jekyll and Mr. Hyde wasn't written until 1886, and Robert Louis Stevenson wasn't even born until 1850. The strange electrical technology in Eliza's world also hints at a sci-fi classic from an earlier period: Frankenstein, published in 1818. So there you go. Messing with timelines is fun! But I'd never want to go back to Victorian times, not really. Too much bad medicine. 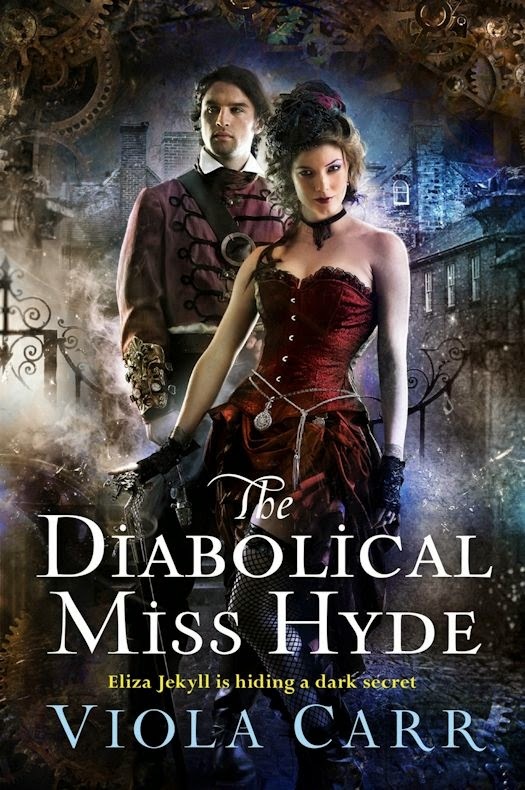 What: One entrant will win a copy of The Diabolical Miss Hyde by Viola Carr from the Author. Who and When: The contest is open to all humans on the planet earth with a mailing address. Contest ends at 11:59 PM US Eastern Time on November 9, 2015. Void where prohibited by law. No purchase necessary. You must be 18 years old or older to enter. I'm a huge fan of the Steampunk genre. I think it started with 20 Leagues Under the Sea and just blossomed from there. I'd love to add this book to my growing collection. I love twists on old classics and steampunk is a favorite genre of mine. This looks fantastic, definitely going to the top of my tbr. Love these covers :) thanks for sharing! First one was great. Looking forward to the next.